NOTE: All posted entries from 2010 and 2011 are being re-catalogued and will return soon. Postings from 2009 and earlier are still interesting and of value but some will be moved to a new Archive area. Thank you for your patience. August 9, 2009 Are We Ready for an Emergency? November 18, 2008 IAEM Announces That Feed the Children Is the First Global NGO to Have Recognized the "Principles of Emergency Management"
For news, information and resources regarding hurricanes Katrina and Rita, please click here. Boston, MA – The Media Access Group at WGBH, a non-profit service of the WGBH Educational Foundation in Boston, Massachusetts, will provide both closed captioning and live description of Barack Obama's presidential inauguration for the PBS presentation of Inauguration 2009, a NewsHour special hosted by Jim Lehrer. The PBS coverage of the inauguration airs live on Tuesday, January 20 from 11AM to 1:30PM EST. While live captioning is an established feature of many television broadcasts, live description, the creation at time of air of a narration track imparting information about visual elements that people who are blind or visually impaired would miss, is a rare service. Dunkin' Donuts is generously sponsoring the description service for this broadcast. In 1993, PBS's coverage of the Clinton inauguration was the first live television program that was made fully accessible to the nation's 36 million deaf, hard-of-hearing, blind and visually impaired viewers. Closed captions display spoken dialogue as text on the television screen. The live captions will be typed by specially trained stenocaptioners - working from WGBH's Boston-based headquarters - and broadcast simultaneously with the live program. The descriptive narration - provided by an expert team of describers - will be audible during pauses in program dialogue and will identify speakers, describe settings and convey other visual information about the event. Captions can be accessed on televisions equipped with built-in decoders (most televisions are equipped), while viewers can hear descriptions by switching to the Second Audio Program (SAP) channel on their stereo TVs. The described coverage will also be streamed live on the Joint Congressional Committee on Inaugural Ceremonies (JCCIC) Web site at http://www.inaugural.senate.gov. On May 1, the Centers for Medicare & Medicaid Services (CMS) issued a proposed rule on the competitive bidding for Durable Medical Equipment, Prosthetics, Orthotics and Supplies (DMEPOS), which included a section entitled "low vision aid exclusion." The "low vision aid exclusion" segment of the regulation proposes that all devices, "irrespective of their size, form, or technological features that use one or more lens to aid vision or provide magnification of images for impaired vision" be excluded from Medicare coverage based on the statutory "eyeglass" exclusion. The Medicare statute excludes coverage for "eyeglasses" except for one pair of "conventional eyeglasses or contact lenses furnished subsequent to each cataract surgery with insertion of an intraocular lens." While there has always been a level of ambiguity with regard to the Congressional intent of this language, the rule released on Monday could revise the Medicare regulations to state that the term "eyeglasses" to be interpreted as any lens used for aiding sight and, thus, excluded from coverage. Recent challenges to Medicare's denial of video monitors and other such aids for the sight-impaired based on the eyeglass exclusion may have prompted this proposed rule. In a 2005 case, Currier v. Thompson, the U.S. District Court for the District of Maine found that a video monitor is not excluded from Medicare coverage based on the eyeglass exclusion and remanded the case back to the U.S. Health and Human Services Secretary to determine if a video monitor is considered under the Medicare benefit as "durable medical equipment" or a "prosthetic device." This recently proposed regulation would invalidate this ruling. According to consumer advocates, closed circuit television (CCTV) and video monitors are relatively common and inexpensive assistive technology used by people with low vision to help them read material by putting it under the "camera" of the CCTV and then reading the enlarged text from a screen. The language in this proposed rule could exclude these technologies from Medicare coverage. NOTE: The proposed rule is on the CMS website at: http://www.cms.hhs.gov/CompetitiveAcqforDMEPOS/downloads/cms1270p_dme.pdf. Washington, DC – The National Organization on Disability is pleased to announce that Hilary Styron, Director of the Emergency Preparedness Initiative was recently nominated by the National Voluntary Organizations Active in Disasters (NVOAD) Awards Committee for a 2006 National VOAD Award for Excellence in the category of Individual Award Response and Recovery. Ms. Styron was nominated for spearheading the Special Needs Assessment for Katrina Evacuees (SNAKE) Deployment Teams into the Gulf region after Hurricane Katrina. The SNAKE teams were the first of their kind and permitted into special needs and general population shelters across the region to conduct rapid assessments of the shelter conditions of people with disabilities. Results of these assessments have been widely circulated across the emergency management and disability-policy industry to assist practitioners and lawmakers in shaping emergency management plans and procedures that are inclusive of the needs of people with disabilities before, during, and after a disaster. Ms. Styron has provided three Congressional briefings on the report findings and continues to work with Congress, the Red Cross, and DHS to address the systemic failures that continue to impact several hundred thousand people with disabilities from the Gulf region. Within 24-hours of receiving approval from the Federal government to deploy into the region, EAD & Associates, LLC., and Strategic Emergency Group, LLC. (SEG), both New York City-based firms, were contracted by EPI to assist in the coordination and selection of four deployment teams sent to Alabama, Louisiana, Mississippi, and Houston, Texas. A separate analysis team was housed in Washington, DC and monitored each deployment team in the field. Ms. Styron works tirelessly to forge partnerships with government agencies, volunteer organizations, emergency managers, care providers, and others in her mission to education everyone on the importance of emergency preparedness for people with disabilities. For more information on NVOAD, please visit www.nvoad.org. and for information on the Emergency Preparedness Initiative or to review the SNAKE Report, please visit www.nod.org/emergency. The Olathe Fire Department is providing special carbon monoxide detectors for residents who are deaf or hard of hearing. Department officials said regular carbon monoxide detectors cost about $20 each, but special devices for the deaf can cost 10 times that. The department has purchased more than 150 detectors with $21,000 from the U.S. Department of Homeland Security. Carbon monoxide is a colorless, odorless gas that fire officials say accounts for half of fatal poisonings in the United States. The special detectors use a combination of bright strobe light and an audible alarm to alert a person to the gas. They can be plugged into a standard outlet. For more information, call (913) 971-6333 or the TTY line at (913) 971-7903. Recent disasters have emphasized that communities will have varying needs when a disaster strikes. This becomes critical when there is a diversity in the population by race, gender, language, and ability. Founder and president emeritus of the National Organization on Disability (NOD) Alan A. Reich died November 11 at his home in McLean, VA. Click here to read the New York Times obituary. In lieu of flowers, the family of Alan Reich has requested that donations be made to the National Organization on Disability, 910 16th Street, NW, Suite 600, Washington, DC 20006. WASHINGTON – The next open meeting of the U.S. Equal Employment Opportunity Commission (EEOC) will examine employer obligations regarding emergency preparedness and evacuation planning for their employees with disabilities, as required by the Americans with Disabilities Act (ADA). Invited experts and guests will discuss best preparedness practices, preparedness planning tips, EEOC preparedness efforts, and other topics. Stakeholders will also offer the Commission their recommendations for further efforts in this area by the EEOC. The Commission will hear from a broad range of invited speakers, including: representatives from the Departments of Homeland Security and Labor, the National Task Force on Fire/Life Safety, EAD and Associates, and the American Association of People with Disabilities. This timely and important Commission meeting will take place on Tuesday, October 25th, from 9:30 a.m. to Noon, in the Clarence M. Mitchell, Jr. Commission Meeting Room (9th Floor), at the EEOC headquarters located at 1801 L Street, N.W. In accordance with the Sunshine Act, the meeting is open for public observation. Members of the public are requested to arrive before 9:30 a.m. to allow sufficient time to complete entry procedures prior to the meeting. Photo identification is required for entry. Any matters not discussed or concluded may be carried over to a later meeting. The Commission agenda is subject to revision. Please call (202) 663-7100 (voice) or (202) 663-4074 (TTY) on the day of the meeting to confirm the schedule. Further information about the Commission and the EEOC's fact sheet on: Obtaining and Using Employee Medical Information as Part of Emergency Evacuation Procedures under the Americans with Disabilities Act and the Rehabilitation Act is available on its web site at http://www.eeoc.gov/facts/evacuation.html. Read the statement of Senator Tom Harkin (D-IA) opposing the nomination of Judge John Roberts for Supreme Court Chief Justice on his Web site at http://harkin.senate.gov/news.cfm?id=246516. EAD & Associates, LLC has been selected by the National Organization on Disability (NOD) Emergency Preparedness Initiative (EPI) to make an assessment of impact and service delivery to those with disabilities, seniors, and medically managed persons affected by Hurricane Katrina. Click here for the official press release. The hearing was on the Accessibility of the House Complex for Persons with Special Needs. The panel included testimony from Elizabeth A. Davis, Managing Director, EAD & Associates, LLC, Hilary Styron, Director, N.O.D. 's Emergency Preparedness Initiative, and Jack J. Murphy, Managing Director, JJM & Associates, LLC. Elizabeth A. Davis, Managing Director of EAD & Associates, LLC spoke at the annual World Conference on Disaster Management in Toronto. For conference information, please go to http://www.wcdm.org/main.html. Judge Upholds Jury Verdict Against Dupoint for $591,000 in disability bias suit by EEOC finding that an employee with a disability cannot be terminated for perceived delay in emergency self-evacuation. To learn more about this case, visit http://www.eeoc.gov/press/6-9-05a.html. EAD & Associates, LLC has been appointed to the Federal Communications Commission's Consumer Advisory Committee to represent the interests of people with disabilities in emergency communications. Managing Director Elizabeth Davis has also been appointed chair of the Homeland Security Subcommittee. Click here to read the official FCC press release. 25 residents from the deaf community began their CERT training on January 25, 2005 in the sixth (CERT06) Community Emergency Response Team (CERT) course, developed under the Community of Monroe Citizen Corps Council and sponsored by the Homeland Security Management Institute of Monroe Community College through a grant to Monroe County. These students from the deaf community received training consisting of four-hour modules, and taught over an eight-week period with the assistance of American Sign Language (ASL) interpreters. Pam Hatch, who was one of the CERT class team leaders, has taken the next step to utilize and promote disaster training in the deaf community. 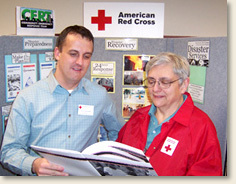 She has become a Citizen Corps Volunteer Leader and a DAT member with the American Red Cross Greater Rochester Chapter. Pam is assisting with the formation of a deaf community group at the Red Cross. Monroe County has more deaf & hard of hearing people per capita than any other area in the country and this team will join the chapter to improve service delivery to this population. Already a dozen members of the deaf community CERT team have taken Red Cross training in sheltering and mass care and many are on track to join the chapter's DAT (Disaster Action) team. Another goal of the group is to increase disaster preparedness education within their community. "We want to increase our quality of service delivery to the deaf community in Monroe County and this team will be instrumental in helping us to do that" said the American Red Cross Greater Rochester NY Chapter Emergency Services Director Leighton Jones. "We hope that the disaster education program will also help address some of the unique disaster preparedness issues within the deaf community and involve more people in volunteering in their neighborhoods." Hogan & Hartson L.L.P. and the Washington Lawyers' Committee for Civil Rights & Urban Affairs reached a settlement agreement with Marshall's, a retail store that requires all Marshall's stores in the U.S. to include people with disabilities in all emergency planning. The settlement was based on an earlier groundbreaking decision by Judge John W. Debelius III of the Circuit Court for Montgomery County, Maryland. In this decision, the court declared that the American with Disabilities Act (the ADA) requires places of public accommodation to consider the needs of people with disabilities in developing emergency evacuation plans. EAD & Associates, LLC was a key consultant on this successful case, working closely with Hogan & Hartson L.L.P. and is proud of the outcome and the impact it will have on emergency preparedness.